OEMs coming up with their own security software isn’t nothing new; we know of several smartphone manufacturers that choose to go in that direction. For me at least, the most common brand that comes to mind when thinking about additional security on a smartphone is Samsung’s Knox security. You might have heard the term ‘tripping Knox’ and wondered what that is all about. Knox is Samsung’s security that works by securing the Samsung internal systems in a fort-like manner where if you penetrate it, the sensors will detect what you have done. That’s what they mean when they say ‘tripping Knox’, as if you have quite literally tripped over a sensor. The part that makes Knox so brilliant — at least from Samsung’s perspective — is that if you do trip over Knox you can’t backtrack and act like you haven’t been there; they will notice it is tripped and that’s how they know they don’t want anything to do with your device. In light of the fact that Samsung operating systems are so popular to tinker with the internal system with root access and custom recoveries, Samsung has implemented this technique to catch you out. It’s long been said that these companies don’t care much at all about you doing what you want with your device. They just don’t want to have to deal with your attempts at getting problems fixed by them, when it’s you who has stepped outside of their boundaries they had set in place. And that’s fair enough too, we don’t really expect them to. However, it’s a ginormous world out there and you could imagine how many people would attempt to get their devices fixed. Better yet, you could imagine how many people out there think they deserve to get their devices fixed, and probably several who would like it done while they stand in front of the service center with a baseball bat. From a large company’s perspective, it’s easy to understand where they are coming from. With all that being said, there are also many of you who know what you are doing, and a problem isn’t necessarily going to start just because you have root access, or have changed the internal system. Additionally, not tinkering with a device isn’t an option for many because it’s far too much fun. 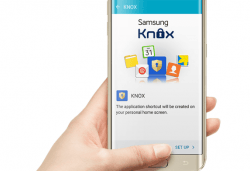 For all those people, you might be interested in learning how to disable Knox on Samsung Galaxy S6 smartphones. 1. Download the terminal Emulator app from the Google Play Store on this page . 3. Those of you who want to disable the Knox notification in the status bar can download the Knox Disabler from this XDA Developers thread . 4. Lastly, the Titanium Backup  app is handy for Knox. You can use Titanium Backup for disabling the Knox notification manager, Knox Agent, Knox general, Knox store and the KMLS Agent. Hopefully that’s helped you learn how to disable Knox on Samsung Galaxy S6 smartphones.